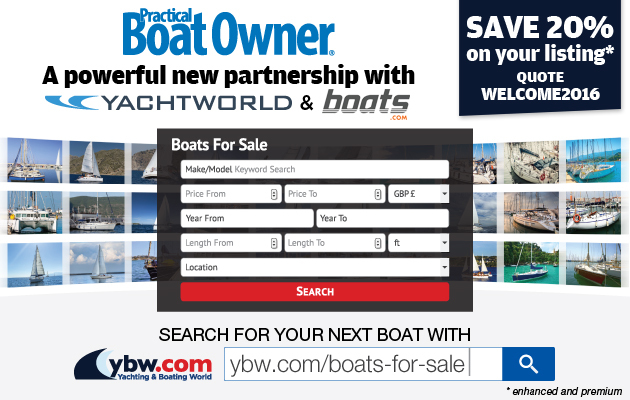 As we stood on the pontoons at Scotland’s Boat Show in mid-October, the visitors told us that the summer had been awful. In fact, the weather – set fair for the foreseeable future – was better than they’d seen all summer. Go sailing, they said. You’ll never see the Clyde like this in October again. We didn’t take much convincing. After all, we reasoned, it would be rude to take Hantu Biru all the way to Scotland and not make the most of the beautiful weather and the stunning scenery, resplendent in its autumn colour. But with two days and the wide Clyde spread out in front of us, where should we head? 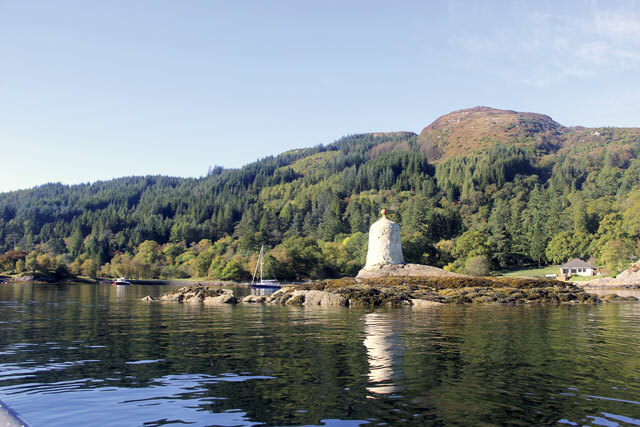 We asked some visitors, and the answer was unanimous – head for the Kyles of Bute. And so we did. In the early afternoon the day after the boat show, the pontoon that had imprisoned Hantu Biru was craned out. After a bustling boat show, it felt like a treat to start the engine and head out of Inverkip into the Clyde. Outside the entrance there was a Force 3 blowing from the north-west, and we hoisted the sails and headed downriver. 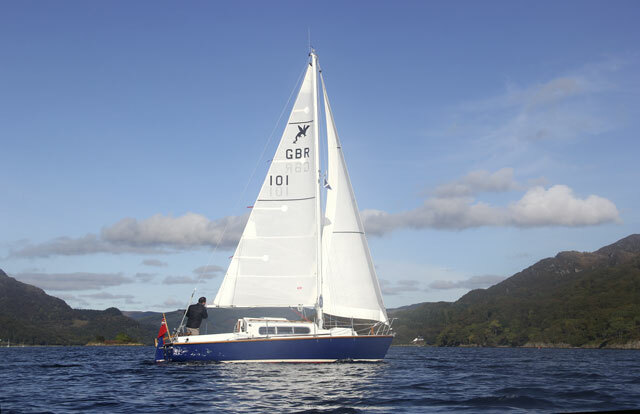 Hantu Biru slipped along nicely in the flat water, the river chuckling under her bow and a lovely low sun illuminating the placid surface of the Clyde and the hills beyond. ever-deepening shade of orange. 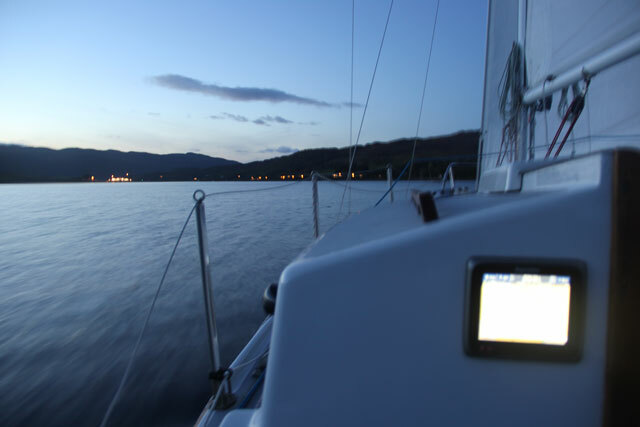 The wind, blowing down the loch, contained frequent wind shifts, and as the sun set we started sailing like a racing boat, tacking on the headers at the edge of the Kyle to give us the best angle on the other tack. As the sun set the temperature dropped, so out came the thermals, fleeces, hats and gloves. Now warm, we were enjoying a magical sail. The Milky Way was clearly visible against the silhouettes of the hills, and Hantu Biru slipped along making barely a ripple. As we made our way up the East Kyle the wind eased, and as we sailed through the moorings on the approach to the Bute Ferry at Colintraive it completely died, so we furled the jib and reached for the engine switch. The nav lights dimmed as the engine struggled to turn over. Bugger. The boat had been at an overcast boat show for three days, instruments and cabin lights turned on, and before that on a lorry with the solar panel covered up. A good few hours of night-time sailing with lights and instruments blazing had reduced its charge to 12.2V, not quite enough to turn the engine over. We should have kept it running longer out of Kip, but the thought of a sail had led us to stop the engine early. Luckily, Hantu Biru’s BMW D7 came with a starting handle, and after 10 minutes of hard work the engine coughed into life, pouring amps into the battery again. Phew. With no damage done, except to our pride, we motored through the Burnt Islands in pitch-blackness, choosing the northerly channel, its marker buoys lit, towards Caladh Harbour. Caladh nestles behind a rocky islet, Eilean Dubh, and opened up under torchlight to show one small boat on a mooring and some houses ashore. We dropped the hook in the deepest patch of water and sat in the cockpit, listening to the eerie birdsong and marvelling at the stars overhead – but soon the cold began to bite and dinner to beckon. We repaired below, and a tasty meal was soon cooking on the stove, which warmed the cabin to an acceptable temperature – as long as the thermals and hats stayed on. Next morning we awoke to a bright, sunny and flat-calm day. Breakfast over, we used our new inflatable kayak tender to paddle around Eilean Dubh and explore the rocky shoreline before heading out for a sail up to the top of the Kyles to see if we could locate the Maids of Bute. Legend has it that two fishermen went out fishing one day and failed to return. Their wives waited forlornly on shore, and waited so long that they turned to stone – and they’re still there today. 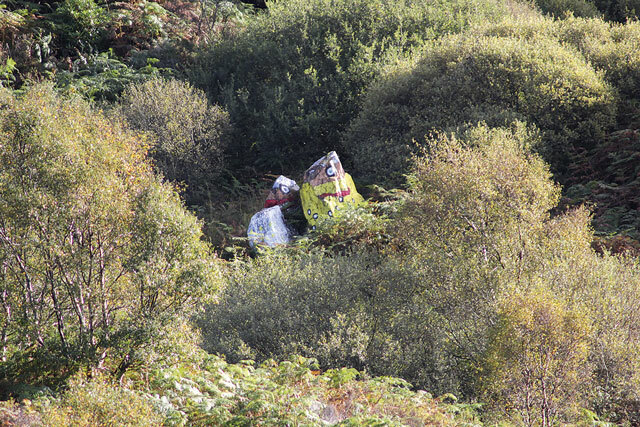 Just west of Buttock Point, we spotted them – two gaudily-painted rocks, one short, one wide. Para Handy described them thus: ‘A sailor could’na have a better wife nor wan of the Maids of Bute; he’ll maybe no’ get mich tocher with her, but she’ll no’ come huntin’ the quays for him or his wages on the Setturday’. After a quick lunch stop anchored in Wreck Bay near the Burnt Islands it was time to head down the East Kyle again. 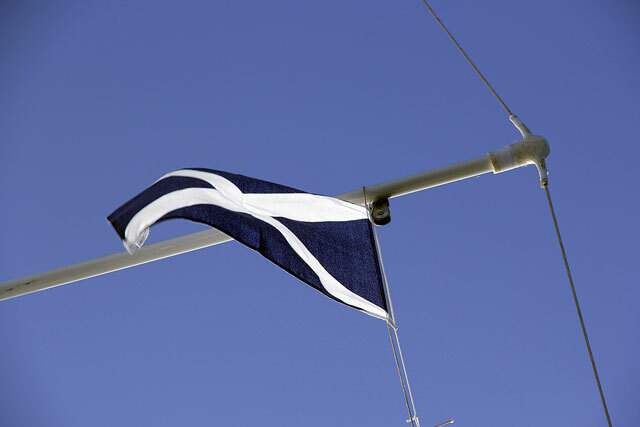 Once more, the wind was on the nose, and we beat slowly towards our second stop, Rothesay. The wind died as we approached and we motored in accompanied by a pair of shy harbour porpoises, easy to spot for once in the oily calm. Rothesay was once a thriving weekend getaway for Glaswegians, but had since lost some of its business to overseas holidays – although things have apparently picked up since the recession. It’s a handsome town from the sea, with imposing Victorian buildings overlooking the harbour. We moored to a moss-covered finger pontoon in the outer harbour, Hantu Biru dwarfed by the 30-footers moored alongside. Visitors to the boat at the show had recommended the fish suppers, and we headed that way to find out. ‘You’ll no’ get fresher than this’, the owner said as he lowered two fillets the size of my head into the fryer. And true to his word, the fish was the best I’d ever tried. in the other in the bright, cold autumn sunshine, life looked pretty good – and the boat performed faultlessly. We’ll be sad to see her go. 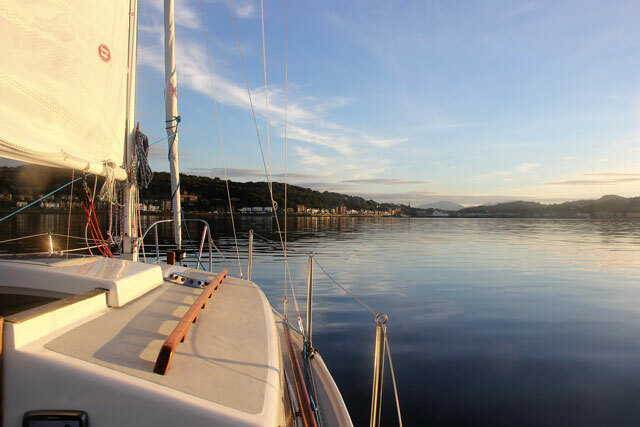 Our quick snapshot of Scottish sailing in unseasonably pleasant weather was an enticing taster of one of the best cruising grounds in the world, and one thing is for sure – it made a fitting final sail to round off the four-year project. 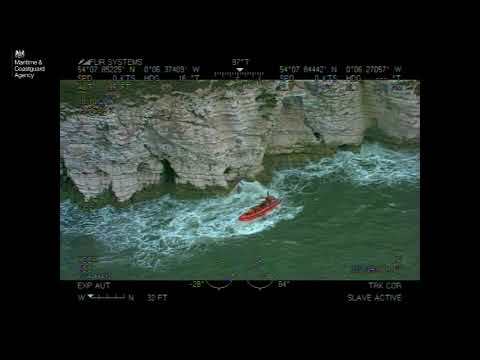 Click here to read about Hantu Biru’s Channel crossing back in the summer of 2015.